Philippine economic managers and executives led by Finance Secretary Carlos Dominguez III. A Philippine delegation led by Finance Secretary Carlos Dominguez III is going to Tokyo this week to share with potential investors the vibrant prospects for the country’s economy and continue high-level dialogues with Japanese ministry officials on the Duterte administration’s flagship infrastructure projects that it aims to implement in cooperation with Japan. Scheduled on June 18 to 21, the Tokyo visit will include a Philippine Economic Briefing (PEB), the second to be held in Tokyo since last year, and the fifth regular meeting of the Philippines-Japan High-Level Committee on Infrastructure and Economic Cooperation. According to Dominguez, the PEB, which will lay out the Duterte administration’s plan to sustain the Philippines’ status as one of the fastest-expanding economies in Asia and its programs for inclusive growth, will also “set the groundwork” for the deal roadshow that the government will roll out for its planned yen-denominated Samurai bonds issue. Executive Secretary Salvador Medialdea; Secretaries Ernesto Pernia of the National Economic and Development Authority (NEDA), Benjamin Diokno of the Department of Budget and Management (DBM), Arthur Tugade of the Department of Transportation (DOTr), and Mark Villar of the Department of Public Works and Highways (DPWH); Bangko Sentral ng Pilipinas Governor Nestor Espenilla Jr.; and Vivencio Dizon, president and CEO of the Bases Conversion and Development Authority (BCDA), are expected to join Dominguez at the PEB scheduled on June 19. While in Tokyo, Dominguez is also set to meet with officials from the Mitsubishi UFJ Financial Group (MUFG), Nomura, Mizuho, Daiwa, and the Sumitomo Mitsui Banking Corporation (SMBC) to discuss the Philippines’ plan to float Samurai bonds by the third or fourth quarter of 2018. He will also hold a separate meeting with officials of the Japan Bank for International Cooperation (JBIC) to discuss possible areas of cooperation between the Philippines and the financial institution. 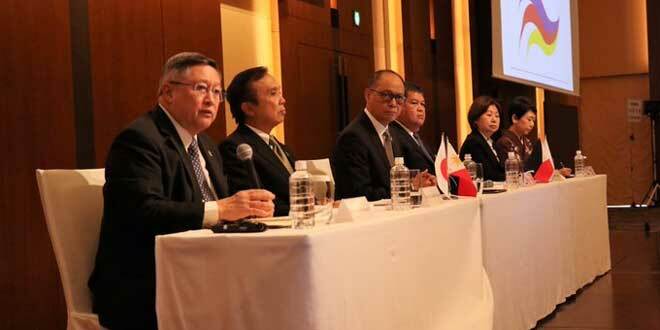 On June 20, Dominguez and Pernia will lead members of the “Build, Build, Build” team in discussing the progress of the flagship infrastructure projects that the Philippines is implementing with Japanese funding support, during the fifth meeting of the Philippines-Japan High-Level Committee on Infrastructure and Economic Cooperation. The fifth high-level meeting will discuss how the two governments could further improve their cooperation and explore ways and measures to eliminate bottlenecks in loan processing and project implementation. “We will look at our projects, to review the progress and to see if there are any bottlenecks we can eliminate,” Dominguez said. Since convening for the first time in March 2017 in Tokyo, the joint committee has made substantial progress in terms of expediting the approval processes on both sides to facilitate Japanese financing of several of the Philippines’ big-ticket infrastructure projects. Last March 16, as a result of the joint committee’s regular meetings, the Philippines and Japan signed the 104.53 billion yen loan agreement for the construction of the first phase of the Metro Manila Subway Project, the country’s first-ever underground rail system. On behalf of their respective governments, Dominguez and Yoshio Wada, the chief representative to the Philippines of the Japan International Cooperation Agency (JICA), signed the loan accord and formally exchanged documents on the construction of the subway, which is one of the flagship infrastructure projects of the Duterte administration under its “Build, Build, Build” program. This 104.53 billion yen loan (approximately $934.75 million) represents the first tranche of the total loan financing requirement of 573.73 billion yen (approximately $5.31 billion or P259.6 billion) pledged by JICA for the 1st phase of the subway project, which is the biggest amount it has ever committed to any country. Before the signing of the loan agreement for the subway project, Dominguez and the previous JICA chief representative to the Philippines, Susumu Ito, inked the 9.399-billion yen (approximately US$89 million or ₱4.25 billion) loan agreement for the construction of the third phase of the Arterial Road Bypass Project that is designed to ease traffic congestion in Bulacan and spur economic growth in the province’s rural areas. Last May 15, the two countries signed an agreement that would provide the Philippine government with a 2-billion yen grant from Japan to support ongoing efforts for the reconstruction and rehabilitation of the devastated city of Marawi in Mindanao. According to the DOF, the ‘Grant Agreement for the Programme for the Support for the Rehabilitation and Reconstruction of Marawi City and Its Surrounding Areas’ will cover infrastructure projects, particularly the construction of transcentral roads that need to be rebuilt immediately in the war-ravaged communities. This grant (approximately $18.66 million or about P970 million), is the fourth aid package provided by Japan to the Philippines following earlier grants that include the provision of heavy equipment for Marawi City’s reconstruction program, which was formalized on Nov. 12 last year between the two governments; a 1.1 billion yen funding support (about $9.8 million) to provide core shelters and livelihood training for Marawi City’s residents under a UN-Habitat (United Nations Human Settlement Programme) project; and $2 million-worth of assistance to help the relief operations of the UN World Food Programme and the UN International Children’s Fund in Marawi. Japan has so far provided the Philippines an estimated $36 million in assistance for Marawi’s relief and rehabilitation operations.